Sometimes choosing wedding cake toppers is harder than picking the cake itself! Discover their meaning, trends, styles and tips. 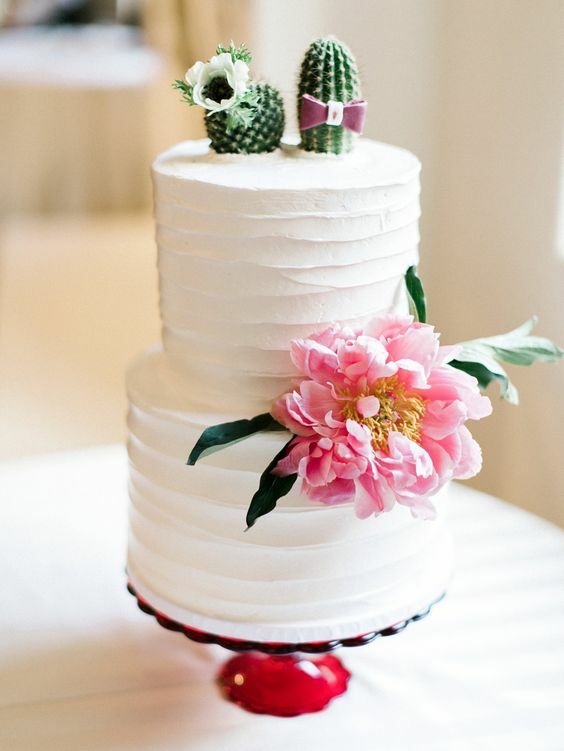 Here’s all you need to know to find the perfect topper for your wedding cake! Read on! 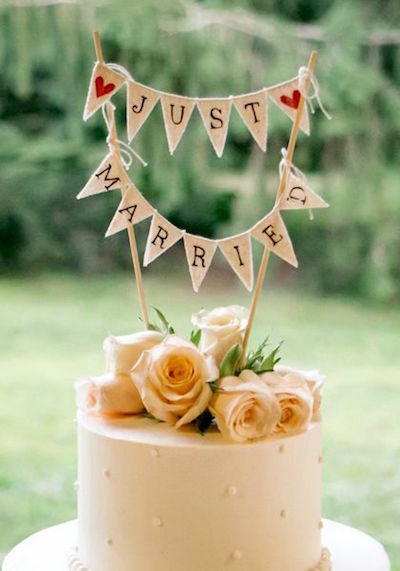 Tiny banners with twine are a great choice for rustic weddings. Photographer: 52Forty Photography Cake by Jeffery A. Miller Catering. The cake topper shines from its place of honor atop the wedding cake for all your guests to see. So, let’s make sure you choose the wedding cake topper that represents you both with pride! Today, my pretties, we’ll cover the topper’s origin, styles, trends and tips to help you choose yours and how to make sure it fits your cake! We have even added a few DIYs so you can make them yourself if money is a bit scarce or you are just plain crafty! There is a lot to know about wedding cake toppers, so let’s get to it! What is a Wedding Cake Topper? 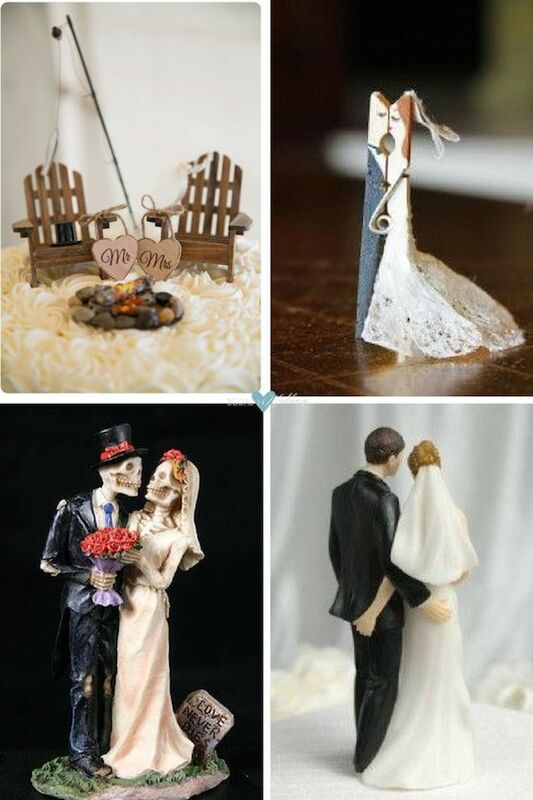 Besides a wedding cake statuette or decor that sits on top of it, wedding cake toppers represent the happy couple. So, the question here is, what would represent you both? Flowers, greenery, a cute figurine or a funny one, maybe? Traditionally, wedding cake toppers consist of a bride and groom figurine that sit on top of the wedding cake. Nowadays, the trend is personalizing these classic figurines to show off the personality of the bride and groom to be. They range from classic and elegant to the very geeky, including some highly personalized toppers that look exactly like the bride and groom! Crates are all the rage right now. 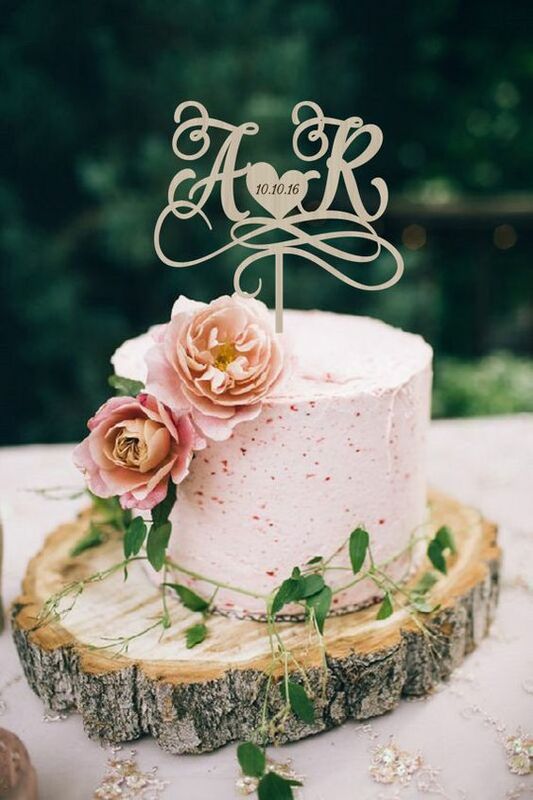 Check out these rustic glam personalized cake topper. Where did wedding cake toppers originate? The exact details of its origin are surrounded by mystery. Nobody really knows when this tradition was incorporated into weddings but legend tells us that over a century ago, a baker’s daughter was about to be married and asked her father for a special wedding gift. She asked him to create a symbol of the love that she and her future husband professed to each other. Therefore, everybody would be able to see it. 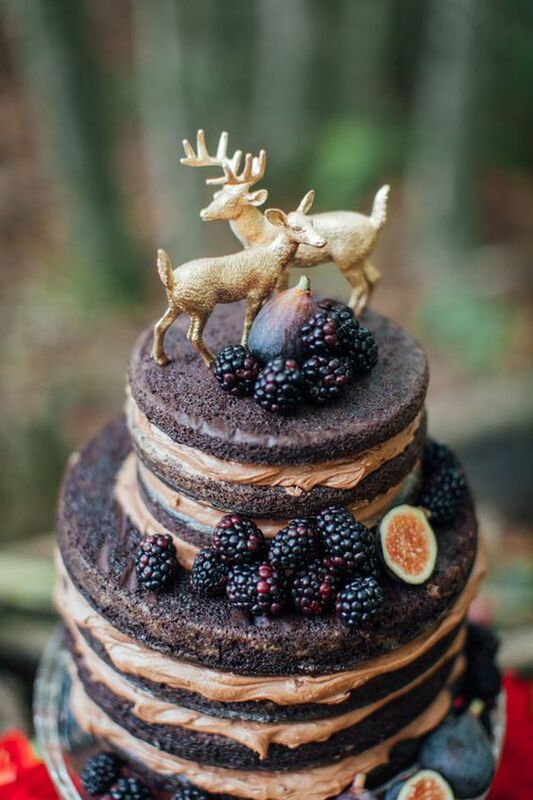 After careful consideration, the father decided upon a unique creation, a gorgeous wedding cake with two fabulous figurines on top of the highest tier. Obviously, the figurines were a representation of his daughter and her future husband. 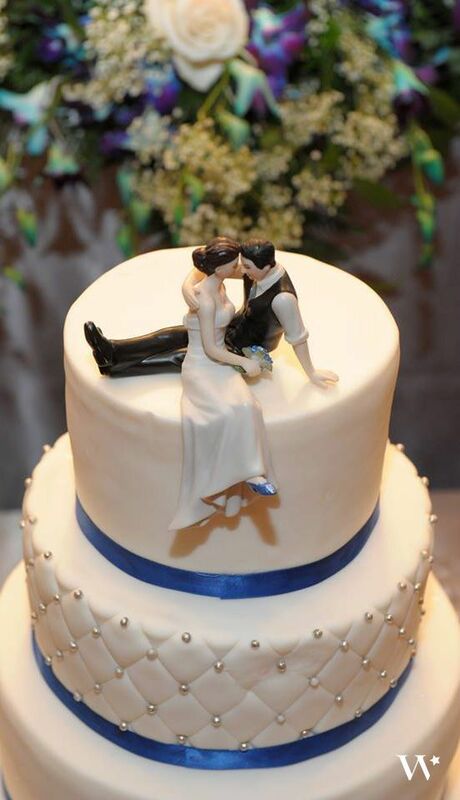 The baker had created the wedding cake topper as the perfect symbol of love and wedded bliss. 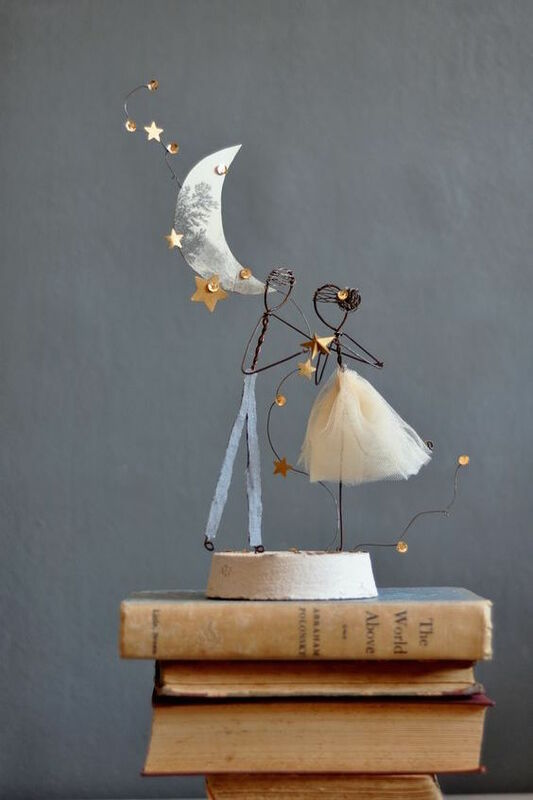 On the day of her wedding, the daughter was so moved by the figurines her father had so lovingly crafted that she stated that it was the best of all the gifts. The wedding cake and the topper were placed where they could be seen by everybody at the reception. Bride and groom carved wood cake topper will bring you an opportunity to personalize your wedding cake and will help make it unique. Caught sneaking a kiss this laid-back couple takes a moment for romance. Hand painted porcelain figurines. 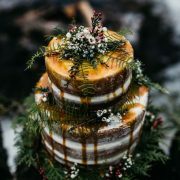 Lovely rustic fall wedding cake topper shot by eschmidtphotography Cake: Haas Bakery. Tips To Find Your Perfectly Unique Topper! 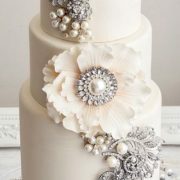 1The cake topper must be a piece that reflects your style as well as the cake’s. It may be a tad more expensive but it will be worth it. Remember, this is a keepsake. If you’re on a tight budget you can DIY your own, or you may choose the traditional figurines that are sold in stores or a few simple flowers to show your love and decorate your wedding cake. Just make sure that they match both yours and the wedding cake styles. 2Let’s get creative! 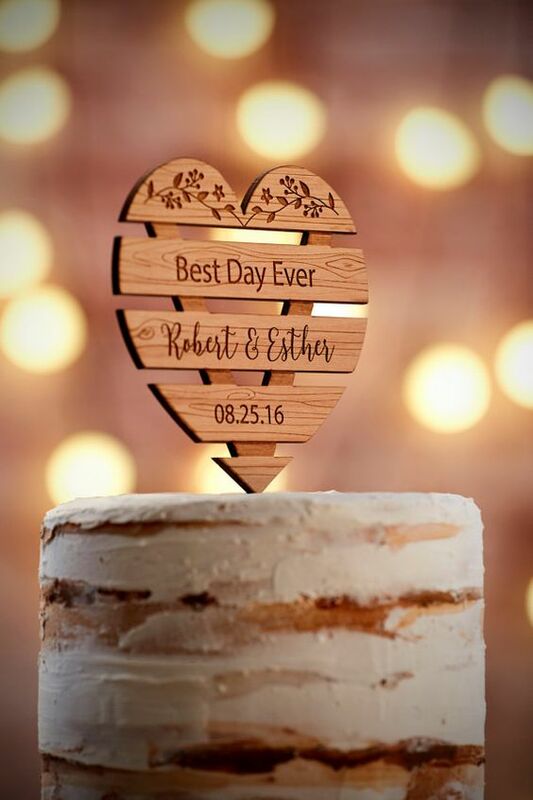 You can choose from a personalized cake topper that looks just like both of you or something that represents a mutual interest or a shared hobby. The personalized wedding cake topper is a very creative detail and it adds an additional layer of romance, sparkle and glamour to the wedding reception. 3Ask your master baker to suggest a few cake topper design ideas that match your chosen confection and pick the one you feel represents you best! 4Now, here’s a romantic, ecological and affordable idea. 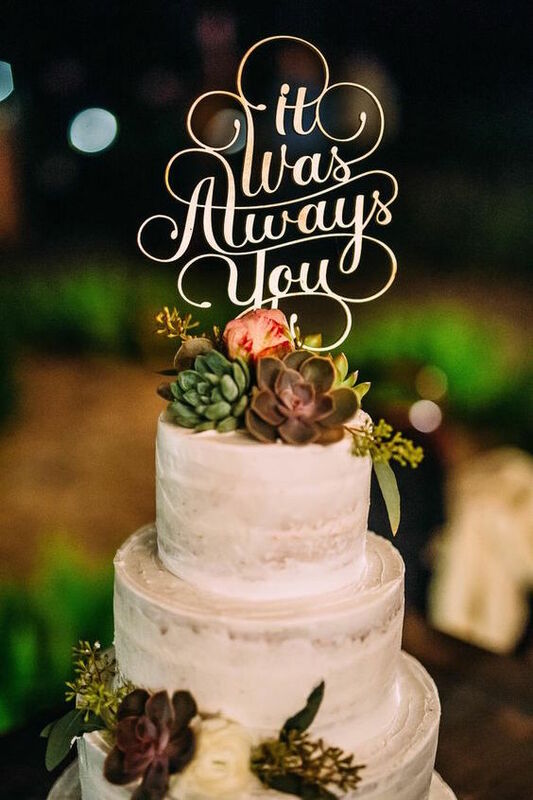 Honor your parents, grandparents or somebody very close to you by adorning your wedding cake with the topper that they used at their wedding! Adorable, amiright? 6Consider the weight of the topper. 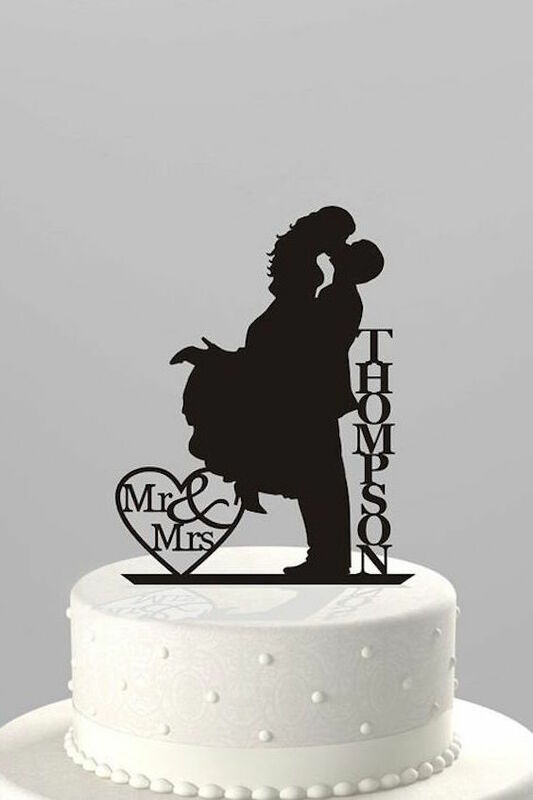 A cake topper that is too heavy, may need additional support in the cake, and you know that means it will cost you more. No matter what style you choose for your wedding cake topper make sure it matches your personality and your wedding theme. 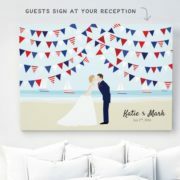 Remember this is a keepsake, a memento from your wedding that you will cherish forever. Wedding cake toppers are not just figurines on top of a cake. They represent the love that flows between two hearts joined forever as one. 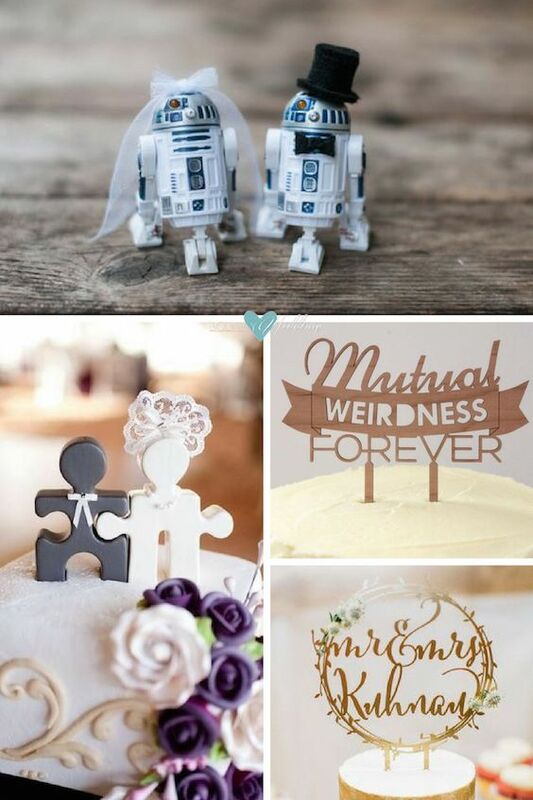 Wonderfully nerdy wedding cake toppers. Wooden puzzle wedding topper. When it comes to cake toppers, weirdness wins. Laser Cut Mr. and Mrs. Wedding Cake Topper. 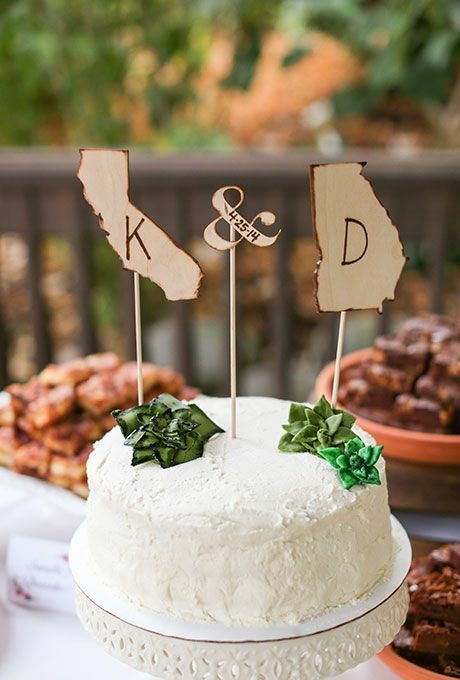 Rustic State monogram cake toppers with the bride and groom’s initials. Wedding cake toppers have come a long way. Now you can pick a topper that depicts a whole movie scene, your favorite Disney characters or 3-D printed look-alike figurines. This is great news for those brides who scream at the mere thought of the traditional wedding cake toppers. 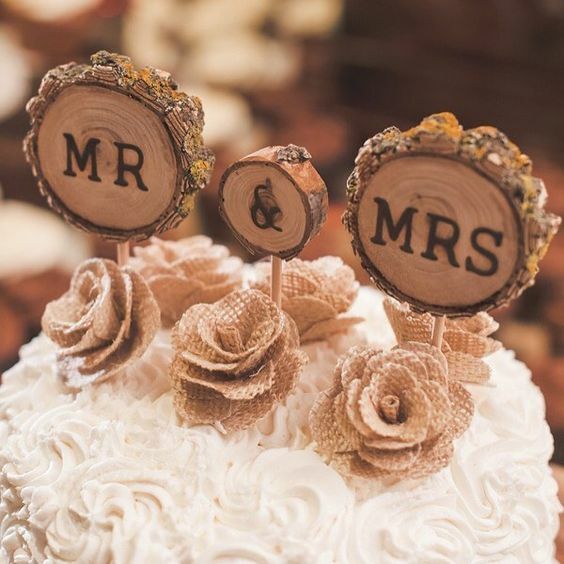 These original and unique wedding cake toppers go from the bride and groom’s initials to the minimalistic trends of rustic weddings of decorating the cake with fresh fruits and flowers instead of the traditional porcelain figurines. Talk about unique toppers! This one takes the cake! (Pun intended) Wedding photographer: Rachel Solomon Photography. These are a far cry from the plastic bride-and-groom figurines of decades past. Funny Wedding Cake Toppers: Original to the Nth Degree! Hilarious and unique wedding cake toppers for original couples. 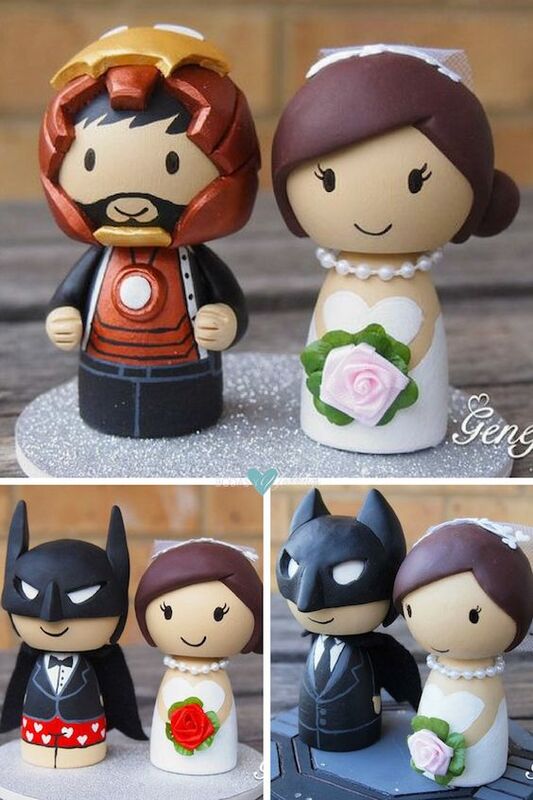 Cute superhero wedding cake toppers. Love Batman in boxer shorts! 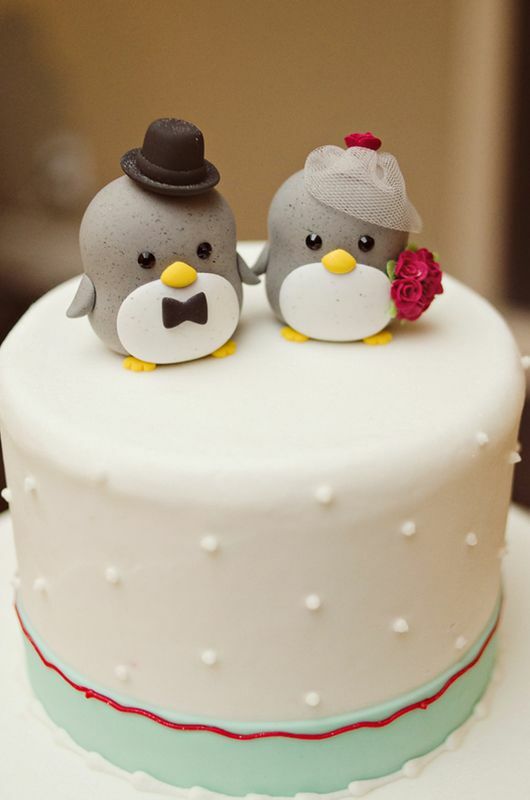 Cutest Wedding Cake Toppers: Inspiration from the Animal Kingdom! There is nothing cuter than these adorable couples on top of the wedding cake: birds, sheep and everything in between. And we mean it! 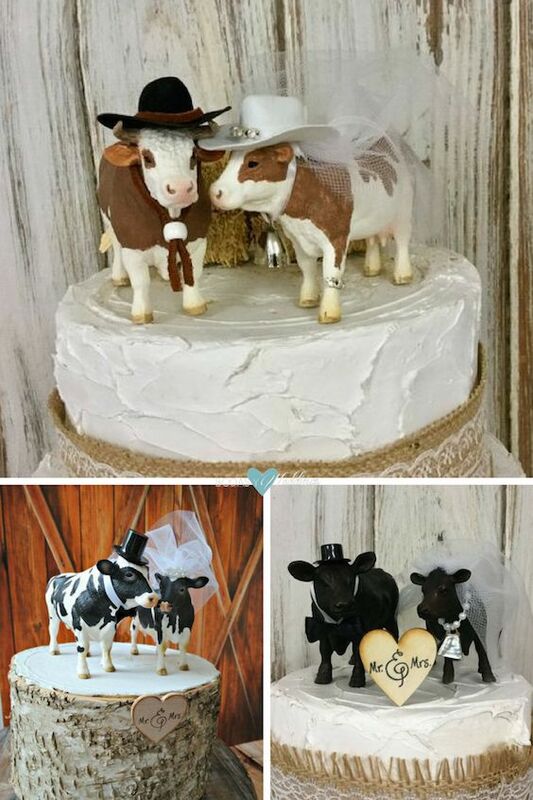 How sweet are these two cows used as a wedding cake topper? This pretty topper is simple yet oh-so-adorable. 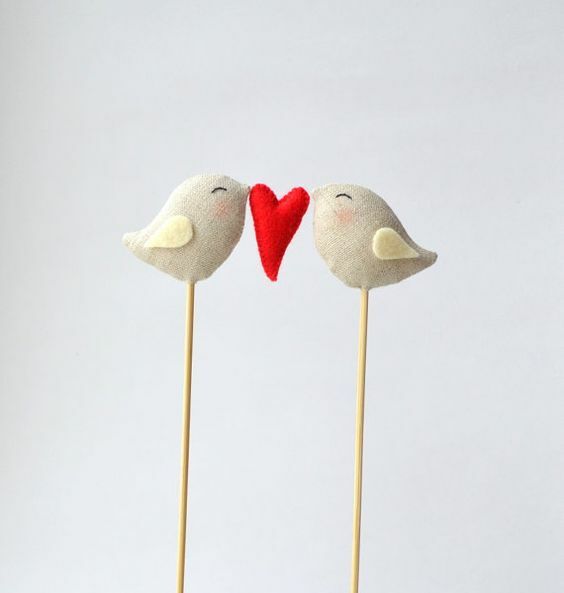 Love birds wedding cake topper. This penguin is wearing a birdcage veil and carrying a red rose bouquet. Wedding photographer: Weber Photography. 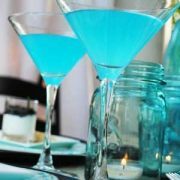 If your wedding budget is tight, never fear! 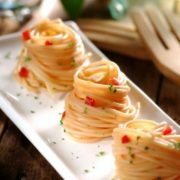 Bodasyweddings is here! 🙂 Check out these simple ideas your can DIY yourself and crown your wedding cake! 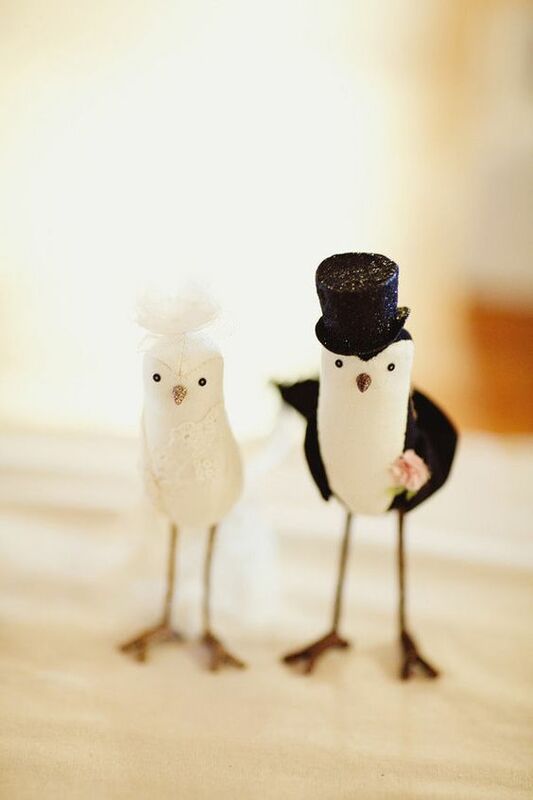 Too cute little cake toppers! 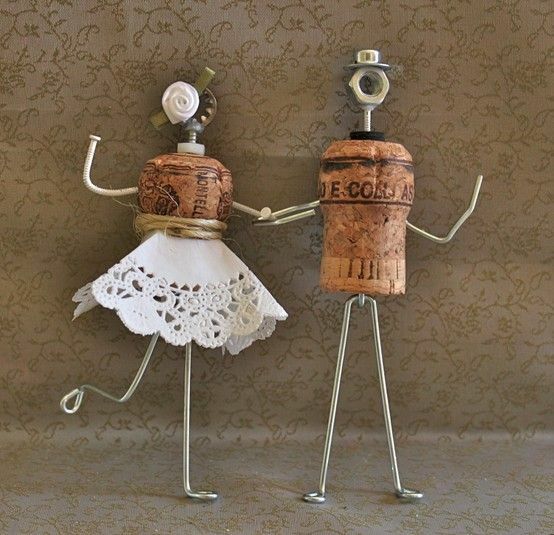 A few nails, a small lace napkin, string and two corks and taddaaaaaaaaa!! It’s up to you to play, my pretties! Why settle for a generic cake topper when you can create something truly personal and meaningful to you? Use action figures from toy stores and other creative sources for a one of a kind topper. Wall-E and Eve cake topper. Faith Michele Photography. Dinosaurs, infinity signs, puzzle pieces and a DIY. These Dinosaurs will be the talk of the wedding, certainly different than your average cake topper. Infinity wedding cake topper $38+. Cake topper puzzle piece. Save money and create an impressive wire design for the top of your cake that looks like a million bucks.. 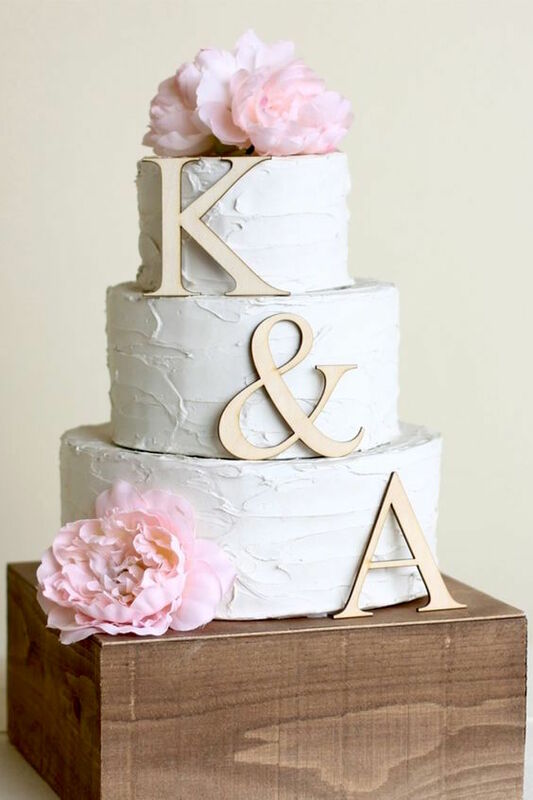 Which are your favorite wedding cake toppers? We’d love to hear from you!! 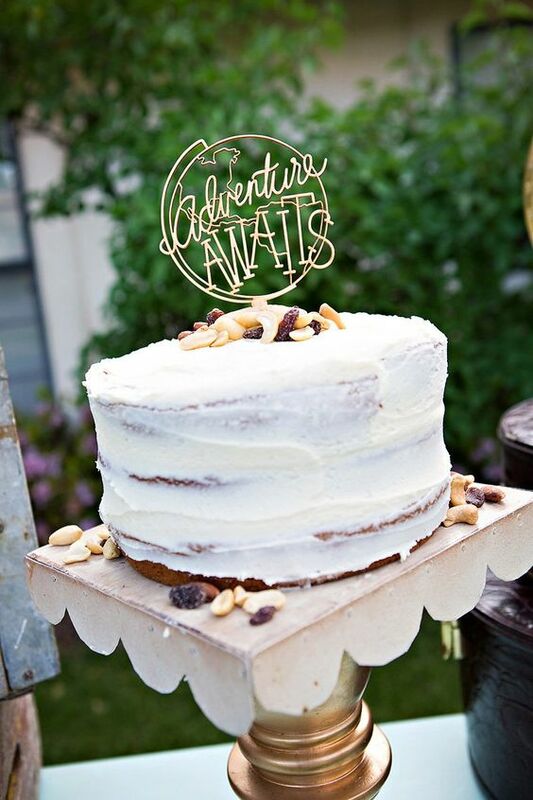 “Adventure awaits” travel or wanderlust wedding cake topper. 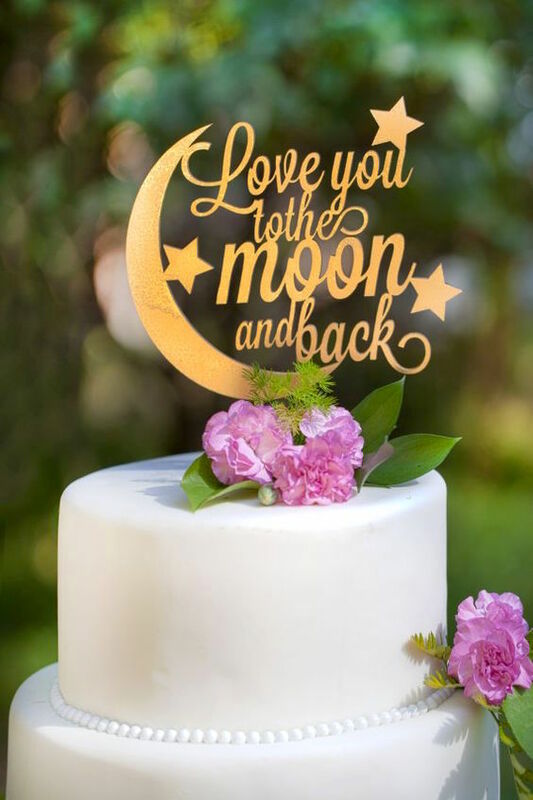 Love You To The Moon And Back wedding cake topper. 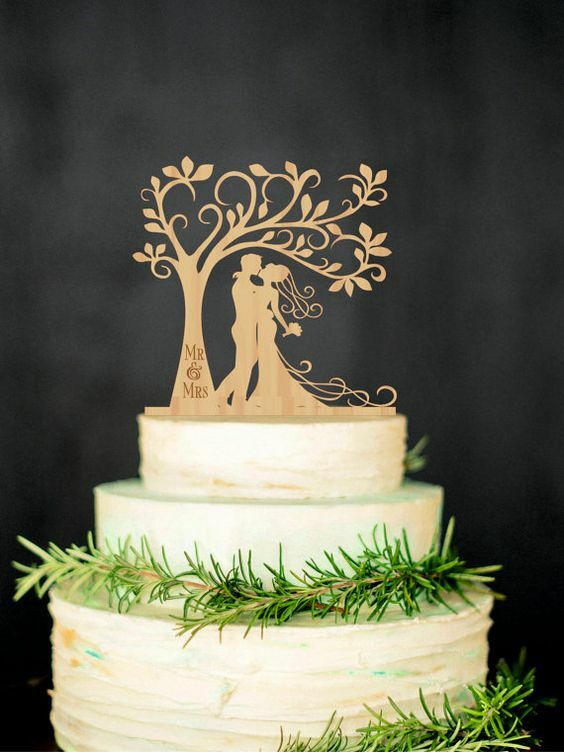 Perfect as an original woodland, rustic and chic wedding cake topper. Personalized wedding cake toppers by BestWeddEver. 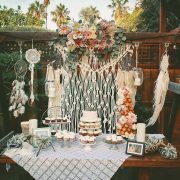 Dark woodland enchanted forest wedding inspiration. 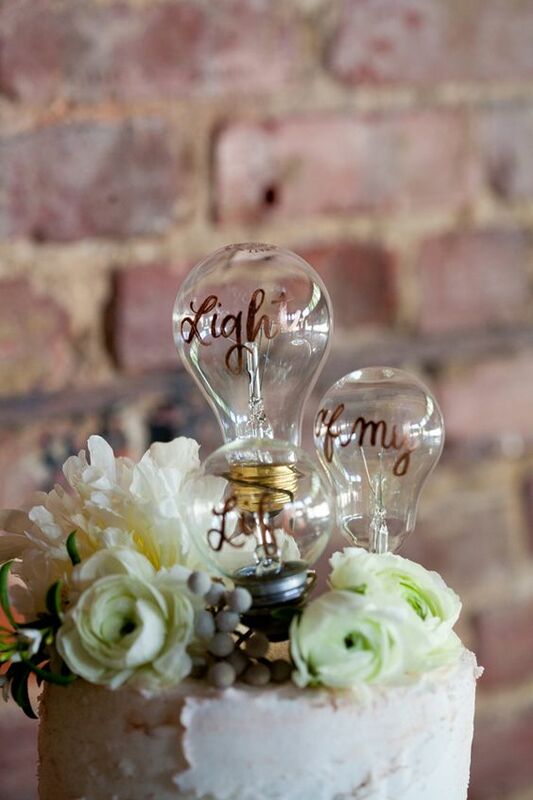 Neo-vintage twist light bulb cake topper. 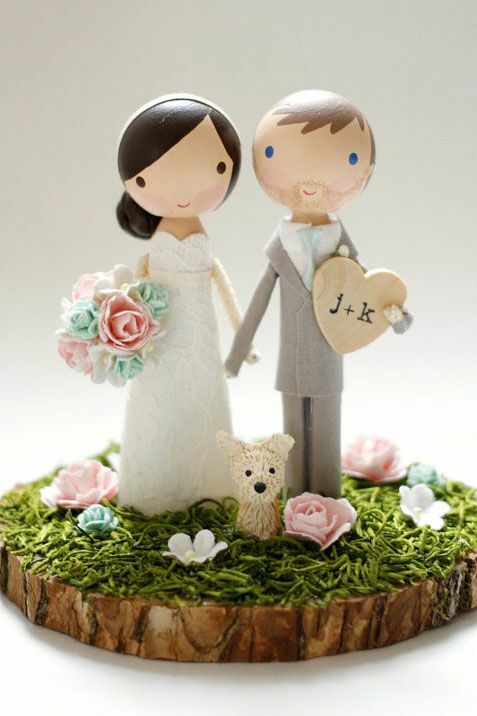 Natural wood three-piece cake topper. Romantic and vintage topper silhouette. 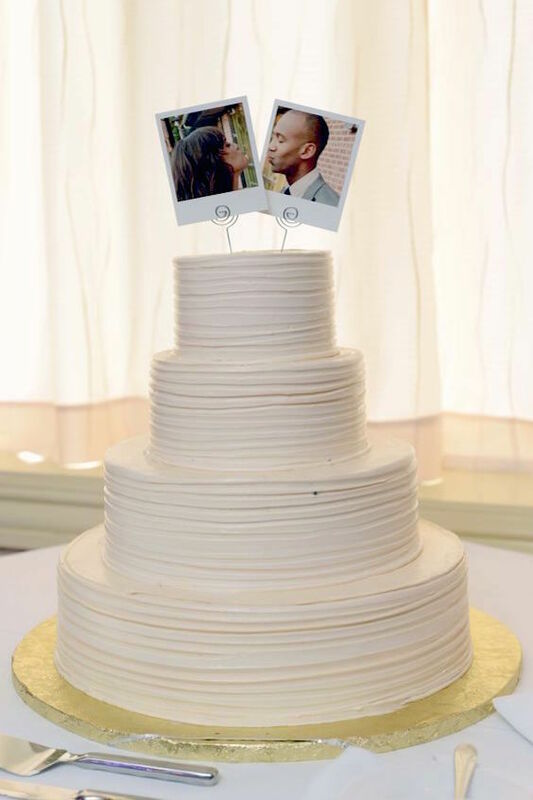 An original personalized DIY Polaroid wedding cake topper. Choosing wedding cake toppers is sometimes harder than picking the cake. Romantic, tall and very light wedding cake toppers. 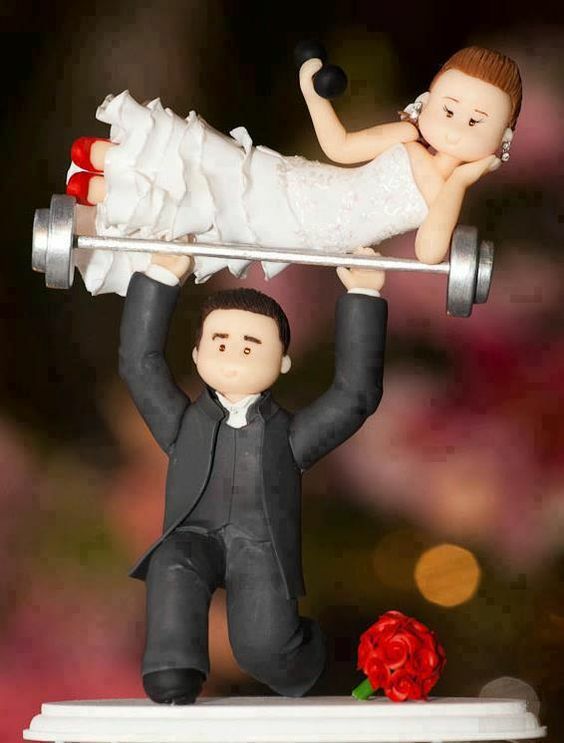 This is the sweetest cake topper ever. 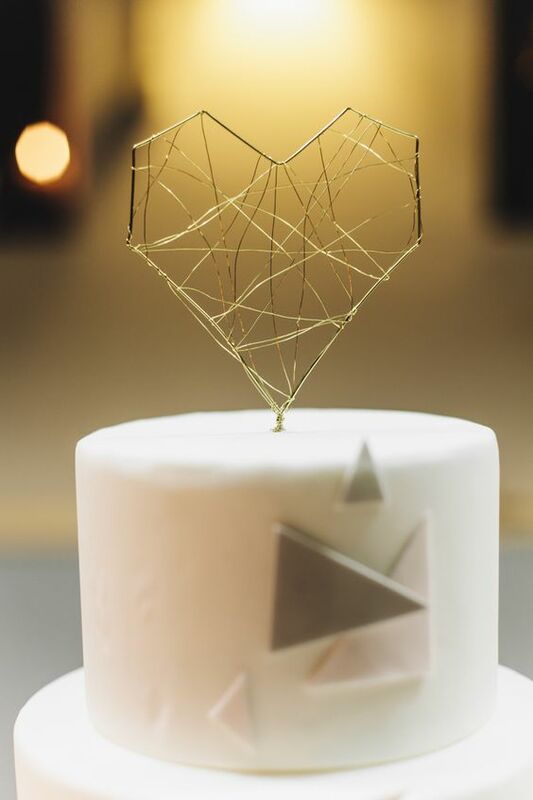 Urban geometric, industrial, DIY cake topper. 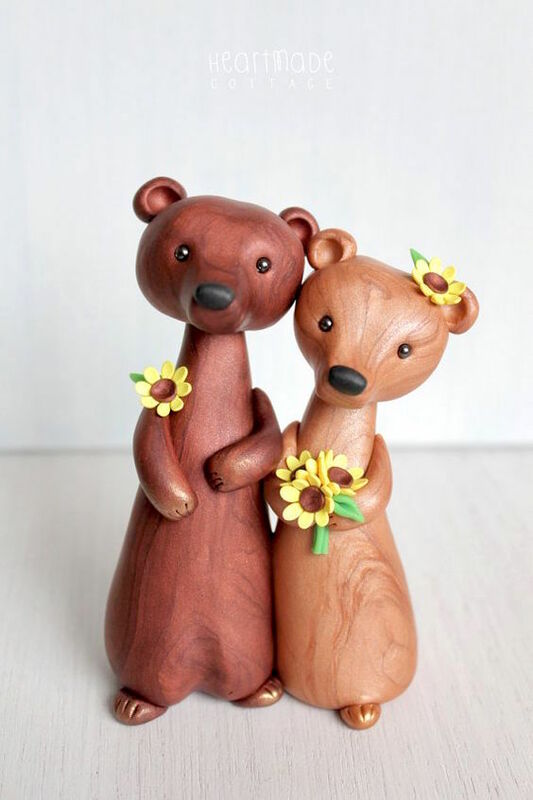 Woodland bears wedding cake topper. Romantic and vintage topper silhouette (From $20). 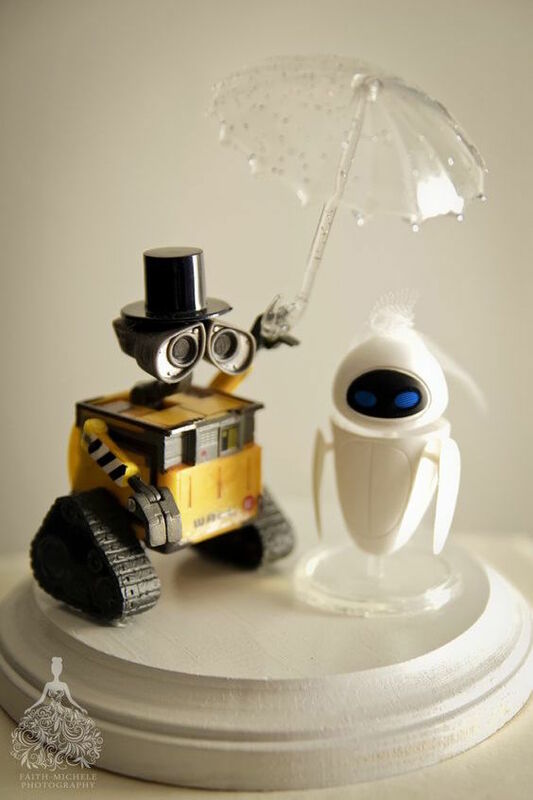 https://bodasyweddings.com/wp-content/uploads/2017/05/Wall-E-and-Eve-cake-topper.jpg 846 564 Bodas y Weddings https://bodasyweddings.com/wp-content/uploads/2019/01/bodasyweddings-logo-byw.png Bodas y Weddings2017-05-02 22:30:472018-05-08 18:35:13The Complete Guide to Wedding Cake Toppers: How to Find Your Perfectly Unique Topper! I am going to make my own with toys, just like you showed here… love the ideas!! Thx! Sounds lovely, Sandy!! <3 Share a pic with us! !